Home » Does your hiring strategy consider Early HR Tech Adopters? Early HR Tech Adopters are ahead of the curve when it comes to embracing the latest hiring innovations. These candidates use at least three different technologies during their job search, and their behaviour can significantly influence how employers attract candidates for their job vacancies. Because Early HR Tech Adopters embrace new hiring technologies so openly and quickly, they provide organisations with new insights into the rate of technology adoption. Most importantly, they also act as a predictor of the specific technologies that will be most desired in the jobs market in the years ahead. If you align to the preferences of Early HR Technology Adopters today, your hiring strategy will be more attractive to the talent pool at large in the years ahead. In today’s tight labour market, where 50% of large UK businesses are struggling to fill job vacancies, it’s never been more important for orgainsations to align to the preferences and behaviours of the candidates they wish to attract. Understanding and aligning to the behaviour of Early HR Tech Adopters can help orgainsations to stand out from the competition, and secure the in-demand talent their business needs to thrive. Early HR Tech Adopters tend to be young, urban, highly mobile and students, evenly divided between males and females. They embrace smartphone apps, social media adverts, virtual job fairs, video interviews, employer website chat, skills challenge tests, voice search via a virtual assistant, and much more – and they’re always on the lookout for the next innovation to embrace. Globally speaking, 11% of candidates qualify as an Early HR Tech Adopters, but their presence does significantly vary from country to country. In Brazil, India and Malaysia, candidates are two-three times more likely to be an Early HR Tech Adopter than the global average. 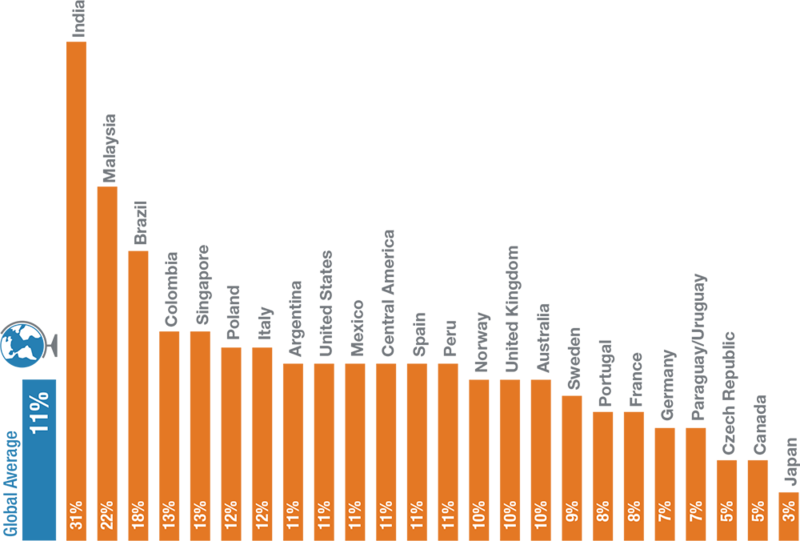 However, in Europe, most countries are some way below the global average. 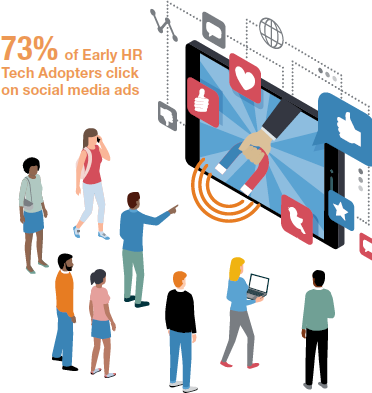 No matter where you’re looking to recruit – employers should assess the likely prevalence of Early HR Tech Adopters in their desired talent pool, and adapt their strategy accordingly. As the name suggests, Early HR Tech Adopters are often the first to embrace new recruitment technologies. Understand the technologies that they’re engaging with right now, and you can start to understand which technologies will be most used by the jobs market at large in the years ahead, and plan accordingly. Right now, social media adverts are extremely popular amongst this group of candidates, so we can predict that this method of advertising job vacancies will continue to grow in importance in the years ahead. In fact, job-related social media adverts are twice as popular with Early HR Tech Adopters as they are with average candidates: 73% of them have clicked on a social media ad, compared to just 31% of the wider market. We’re all spending more and more time on social media, and it’s quickly becoming our go-to place for news and information. With this in mind, it’s hardly surprising that these platforms have become an important way to reach prospective candidates. Nonetheless, as site retargeting (serving up ads based on a user’s browsing history) and contextual retargeting (serving ads based on online articles read) become ever more sophisticated, predictive algorithms will make social media advertising more effective and efficient than ever before. Embracing technology during the hiring process is an important way for organisations to attract both Early HR Tech Adopters and the wider talent pool. However, human contact is still critical too. 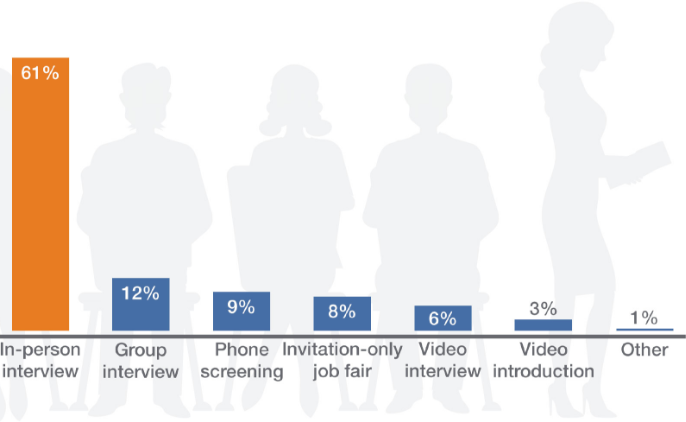 When we asked UK candidates about their preferred recruitment method, 61% selected in-person interviews, demonstrating that human connection is still highly valued. Attracting and retaining the right talent should not be a battle between human and robot. With the right skills mix, personal interaction will augment rather than compete with technology. It’s important to blend high-tech with high-touch when recruiting for open job vacancies. In fact, with so much of the initial contact between candidates and employers becoming automated, the need for in-person interaction is only set to further increase in importance. If you’d like to learn more about the importance of blending high-tech with high-touch during the hiring process, you can download our new whitepaper Siri, Find Me a New Job.